Changes in the app development industry are happening at a frantic pace just like everything else pertaining to the Internet. New technologies, development environments and business strategies emerge every day to challenge the status quo. To be a successful mobile app developer, you need to know some differences between mobile app and website development. Despite the tremendous pace of change, there is one variable pertaining to mobile app development that will continue to increase in importance into the future, user experience. According to the Nielsen Norman Group, user experience encompasses all aspects of the end-user’s interaction with the company, its services, and its products. A user’s experience with software or websites is primarily with the application’s user interface. User interface is defined as the means by which the user and a computer system interact, in particular to the use of input devices and software. To summarize a user’s experience is defined through their interaction with an application’s user interface. Mobile app developers would be wise to follow the lead of the consumer and enterprise technology industries. These industries have been successful by leading the design process with the user’s experience. The mobile app development industry, when compared to the website development industry is a new and emerging field. When we first started in 2009, there were only a handful of companies looking to build mobile apps and even fewer that could build them. In contrast, website development has been around for over 20 years. It is a rapidly maturing industry. Having been in the website development industry for the last sixteen years, I can tell you that it has been primarily technology that has led the design process. We sought to build websites and the user’s experience around their interaction with the technology. A common mistake that many new mobile app developers make is to treat their mobile app like a website with a smaller screen. Many app developers will try to shrink their apps or websites to work on a mobile screen. While this is a noble goal, many of these same apps have been failures in terms of business goals, especially if these apps were outward focused. In other words, these apps did not attract the number of downloads that it was hoped for. If they were downloaded, they were seldom used and in many cases deleted from the mobile device that they were installed on. For mobile app development to be successful, we have learned to design for mobile first. Unlike with web and desktop design, the designer and developer have to do a lot more with a lot less. They must also do so while providing a pleasurable experience. This is the mobile experience and it comes with many more limitations than website design. The mobile experience is not about software working on mobile phones. It is about moving around or mobility. The devices people are using are their mobile phones, tablets and soon, wearables such as the iWatch. The rules that applied to desktop or laptop development will not necessarily apply to the degree that they once did. Mobility is about the mobile experience and not so much the device. As stated earlier, mobile app development requires the developer to do much more with less when compared to traditional web design. For example, security and privacy considerations are very important when developing mobile apps. Security and privacy updates for websites are very straightforward for websites. All you do is update the code on your production server. In contrast, security and privacy updates for mobile apps require a great deal more preparation and planning. Updates for mobile apps need to be pushed out to the mobile device. As a result, poor planning and mistakes when it comes to an update can become apparent immediately in a very big way. In contrast, this is not the case with a website code release. The only users that will see a mistake are those that visit your site. A second difference we have seen with mobile app development has to do with the build cycles. New iterations and feature sets are much slower in website development than with mobile devices. Previously, new functionality and features were released at regularly scheduled intervals. With mobile app development, new functionality and features may need to be rolled out when needed. To summarize, aspects of the mobile app development and maintenance process have become increasingly reactive as opposed to the website development, which may be increasingly proactive. There are several additional differences between with mobile app development and website development that need to be considered. 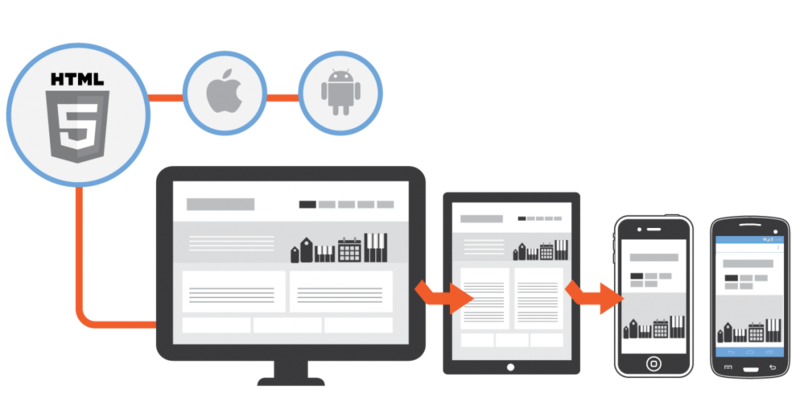 Bandwidth constraints are much more limiting with mobile app development. While download speeds are important in website development, they are even more so in mobile app development because there is such a range of download speeds in a wireless environment. A fast download speed is core requirements when developing mobile apps. Over the years, we have learned many differences when developing mobile apps over websites. Describing everything learned cannot be adequately conveyed in a blog post, many blog posts, an e-book or a podcast. Hopefully, this is a good starter in understanding the differences between mobile app and website development. If you are in need of mobile app development services or have some projects that need to be completed, we are here to help. We have been developing mobile apps for IOS and Android since 2009. O Clock Software is an Owler Hot In 2016 winner!